With Namm 2015 up and running we are being spoilt the amount of new products from our favourite brands. 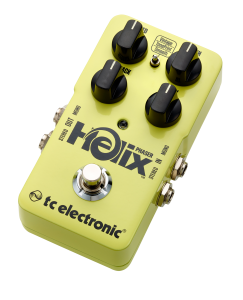 Amongst several other items TC Electronic have announced 2 new pedals to add to their popular compact guitar effects pedal range. No you’re not hallucinating, the Helix Phaser has finally landed and it’s ready to take your tone to new inspiring heights with all the massive mind-bending swooshes and swirly goodness you could possibly desire. But be warned! Once you turn this pedal on, you may never want to turn it off again. Tons of guitarists throughout history have sworn by phasers as their secret tone weapon. It’s an effect that’s helped define countless legendary records within the world of pop, rock, metal and indie and once you kick in Helix Phaser, you’ll know why! With its extensive set of controls, the Helix Phaser enables you to dial in everything from vibrant vintage-sounding Gilmour swirls, big and bold Van Halen sweeps to more modern phaser tones a la Smashing Pumpkins and Radiohead. Now add True Bypass and Analog-Dry-Through to the mix and you have your new favorite sonic drug. You know we can’t release anything without putting that certain TC twist on it. So instead of making a simple set-it-and-forget-it phaser, we went ahead and created the most flexible and versatile phaser ever. You’ll get everything from subtle sweeps to massive sonic bends straight out of the box, but hook it up to our free TonePrint Editor and all that’s left to say is HOLY MOTHER OF TONE! Tone-tweaking paradise awaits, with only the sky and your imagination as the limit. We’ve poured our heart and soul into Viscous Vibe and there’s no hiding that we’re extremely proud of what we’ve achieved. 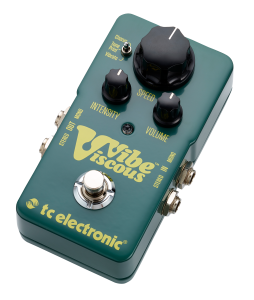 Its dead-on recreations of the legendary gooey phasey goodness and thick dramatic swirls of the original Shin-Ei Uni-Vibe* unit already makes it epic, but then transferring it all to a high-quality compact design that won’t break the bank – that just makes it epic beyond belief.